Pieter Obels (b.1968, Kruisland, NL) lives and works in The Netherlands. His sculptures were featured in numerous solo and group exhibitions such as the Solo Project at Basel Art Fair, Switzerland (2015; 2014); the Swiss Triennial Festival of Sculpture (2015); the Schlosspark in Koln-Stammhein, Germany (2013); and the Gunzburg Sculpture Park, Germany (2013) amongst others. Obels’s work is actively sought after internationally by private collectors and is part of many public collections across Europe. In spite of the fact that steel is generally considered as rough and austere, Pieter Obels’ sculptures seem to be controverting the intrinsic possibilities of the material. When one looks at Richard Serra’s monumental steel slabs and wonders at the curves he manages to give his material, feelings of huge weight, size and strength arise. 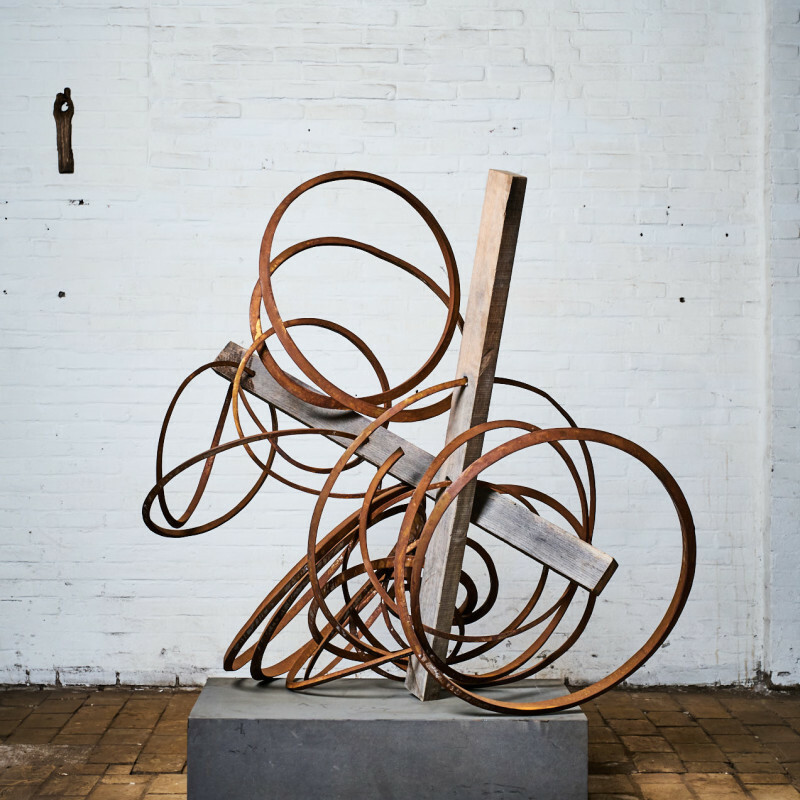 Pieter Obels works with Corten steel, yet what his works convey above all is light and grace as he bends the steel into extraordinarily delicate and winding shapes. The two artistic worlds couldn’t be further apart. It is almost as if we were watching the yin and yang of the same material. Through a clever interplay of rigidity and dynamism, Obels work occupies a space deftly lingering between a sense of weight and weightlessness. His sculptures completely confound our perceptions of how a steel sculpture should look like and behave. The bends in the work appear to defy what the material can be persuaded to do.